This brief calculates employment multipliers by industry to illustrate the importance of these linkages, updating earlier work by Bivens (2003) and Baker and Lee (1993). Employment multipliers measure how the creation or destruction of output or employment in a particular industry translates into wider employment changes throughout the economy. Production in a given economic sector involves linkages with other sectors—that is, production in one industry depends on suppliers in other industries (backward linkages), while wages earned in the production and supplier sectors are spent in other economic sectors (forward linkages). In the case of automobile production, there are backward linkages to industries that produce tires, glass for windshields, and steel for automobile frames (among many others). Forward linkages occur when automobile workers (and suppliers’ employees) spend their income in restaurants and retail stores and at the doctor (to name just a few). Industries that are heavy users of materials are vital to their suppliers. If an automobile factory were to close, its suppliers in the glass, steel, and rubber industries would have a big hole to fill in demand for their own output. Industries that pay higher wages are vital to their forward-linked industries. If a steel factory closed, surrounding restaurants and retail malls would also have a big hole to fill in demand for their output. There are two obvious ways to measure how intensive an industry’s backward and forward linkages are to the rest of the economy. The first estimates the ripple effects of a given number of jobs being lost directly in an industry. In this case, the direct job loss is assumed to be, say, 100, and then the resulting backward and forward ripple effects can be estimated. The second takes a given dollar value of final demand for an industry’s output and calculates how much of this final demand spills over into backward- and forward-linked industries. An example would be assessing the impact of a fall of $1 million in final demand for autos (that is, $1 million less being spent on cars by consumers). This fall in final demand would cost jobs directly in the auto production industry, but would also cause demand to fall in supplier industries and in forward-linked industries that rely on automobile workers (and on workers in the supplier industries) to purchase their output. With the right data, researchers can empirically estimate the number of jobs lost in each link of these chains. There are virtues and drawbacks to both the output and the employment measures as the bases of employment multipliers (as discussed in the methodology appendix); this paper presents estimates using both measures. Would the closing of a factory that manufactures durable goods and employs 1,000 people have a greater impact on the overall economy than the closing of a retail shopping mall that employs 1,000 people? The direct impacts (1,000 jobs lost) are the same; employment multipliers can show us what the total indirect effects will be. As seen in Table 1, the number of indirect jobs lost for every 100 direct jobs lost are 744.1 for durable manufacturing and 122.1 for retail trade. Therefore, the estimated total number of indirect jobs lost if the auto factory closed would be 7,441; the estimated indirect job loss if the shopping mall closed would be 1,221. We use a similar example to look at the question from a different angle: What are the effects on jobs when the demand for output drops by a certain amount? Specifically, would the disappearance of $1 million in final demand for output from factories producing durable goods have the same aggregate jobs impact as the disappearance of $1 million in retail? In this case, the direct jobs lost in durable manufacturing stemming from a $1 million reduction in final demand would be smaller—about two jobs in durable goods manufacturing compared with about 10 jobs in retail. (See Table 2, “durable manufacturing” and “retail trade” rows.) This is because durable goods production is far more productive than retail and hence fewer direct jobs are needed per dollar of output. However, the backward and forward linkages for durable goods cause this direct output loss to ripple far more widely throughout the job market. The employment multipliers in Table 1 show a total of 16.5 indirect jobs lost per $1 million drop in demand for durable manufacturing, compared with 10.6 indirect jobs lost for the same demand drop in retail. This means that, while direct job loss is much lower in durable manufacturing, total job loss (including both indirect and direct jobs) for a $1 million drop in demand is similar in durable manufacturing and retail (18.3 and 20.5, respectively). Notes: See methods appendix for derivation. The industry-specific multipliers from Appendix Table A1 are weighted and summed across industries within major industry groups to get the multipliers in this table. For the per-100-jobs multipliers, the weight used is hours of work (weights are included in the Bureau of Labor Statistics Employment Requirements Matrices data). Notes: See methods appendix for derivation. The industry-specific multipliers from Appendix Table A2 are weighted and summed across industries within major industry groups to get the multipliers in this table. For the per-$1-million multipliers, the weight used is an output weight (weights are included in the Bureau of Labor Statistics Employment Requirements Matrices data). An understanding of employment multipliers—the degree of backward and forward linkages that exists between industries—may often be useful to policymakers and analysts. As an example, the three largest U.S. automobile firms (General Motors, Ford, and Chrysler) directly employ substantially less than 200,000 workers in the United States. Yet it was widely (and correctly) considered imperative among policymakers to not let these firms fail and become casualties of the financial crisis of late 2008. This belief from policymakers was driven by the fully rational fear that the substantial backward and forward linkages from auto assembly jobs would be large enough to cause mammoth ripple effects throughout the economy. Without understanding the scope of these effects, this decision would be harder to understand. This report makes these linkages concrete and measurable by calculating employment multipliers two ways and provides estimates for 179 private-sector industries. It also provides a methodology and accompanying spreadsheet to allow others to experiment with calculations. This research was made possible by support from the Alliance for American Manufacturing. I calculate the employment multipliers on two different bases: per each 100 jobs in an industry and per each $1 million of final demand for an industry’s output. Supplier jobs are generally the most intuitive category of indirect employment changes. Put simply, when jobs are lost in one industry, the industries that provide inputs and materials also suffer losses. Take a concrete example: When coal-mining activity shrinks, it leads to a reduction in demand for industries that provide inputs to coal mining, such as those that provide safety equipment, industrial equipment, and/or transportation equipment and services. Supplier job estimates can be calculated directly from the employment requirements matrices (ERM) provided by the Bureau of Labor Statistics (BLS). The BLS ERM shows how many jobs are supported by $1 million in final demand in a given industry, jobs both in the industry directly satisfying the final demand as well as ones supplying inputs. For example, each $1 million in final demand for construction services supports jobs in the construction industry, but also supports jobs in concrete production, bulldozer manufacturing, and accounting services. The ERM tracks how many jobs in these supplier industries are supported by each $1 million in construction services purchased. To obtain materials supply jobs per each $1 million in final demand, I sum up all rows in the column vector from the ERM, and then subtract out the direct jobs. For construction, I simply sum all nonconstruction entries in the column vector from the ERM. Even these most basic statistics, derived directly with very little manipulation from the BLS ERM, indicate why using two separate bases for the employment multiplier (per 100 jobs or per $1 million of final demand) might be helpful. Take, for instance, the comparison of per-job estimates in two industries—one in which each $1 million in final demand is associated with just one direct job in the industry, but 10 jobs in the materials supplier industries, and another where this split is five direct jobs to six materials supplier jobs. 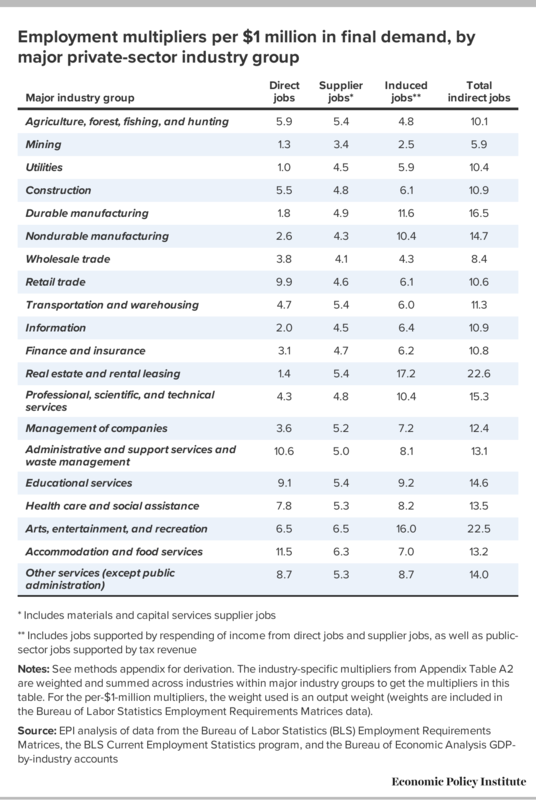 In this case, the sum of direct and material supply jobs in these industries is identical per each $1 million (11 jobs). But comparing them on a per-job basis is comparing two very different flows of final demand. In the industry with only one direct job per $1 million of final demand, it takes $100 million in final demand to support 100 direct jobs. But in the industry with five direct jobs per $1 million it takes only $20 million to support 100 direct jobs. This example might make it seem as if the per-job measure is less useful generally. But that’s not necessarily the case. Media reports of plant closings, for example, often report the number of jobs, not the economic output, that will be lost to a local community. Rather than having to guess at the output loss, the per-job multipliers in this report can be used by industry analysts to get an estimate of the economic ripple effects of these losses. One weakness of the BLS ERM is that it does not account for the depreciation of capital goods (plant, equipment, and structures) that is caused by production. This could have nontrivial impacts on jobs supported in capital-intensive industries. Further, because capital-intensive industries often have quite small numbers of direct jobs associated with a dollar of output, not accounting for the capital services supplies to these industries could greatly underestimate their overall effect on the economy. To correct this failure to account for capital services supplies, I estimate the number of jobs associated with producing the capital goods that would be needed to replace the amount of depreciation associated with each $1 million in final demand and for each 100 direct jobs in an industry. I first estimate the value of capital services used in each industry’s production. To do this, I use data from the Bureau of Economic Analysis (BEA) on gross domestic product by industry. The KLEMS measures from this data (capital, labor, energy, materials, and suppliers) provide an estimate of the capital share of industry output (that is, the share of income generated by each industry that goes to pay owners of capital goods rather than workers or suppliers). Combining industry output (obtained from the BLS ERM data) with the capital share of output provides an estimate of the amount of new capital goods that must be produced each period to replace this capital service flow. Essentially, capital-intensive industries will have to spend more money to replace capital services that are used up during production. Based on ratios that approximately reflect the economywide division of aggregate capital investment to structures versus equipment, I assume that 40 percent of this total spending flows into construction to replace new structures and that 60 percent flows into equipment manufacturing to replace machinery. I then use the ERM to calculate how many jobs are associated with the production of this structure and equipment investment. This provides my estimate of the number of capital supplier jobs associated with each $1 million in final demand for an industry. To get a number on capital supplier jobs associated with each direct job in an industry, I make a small manipulation of the data. The first expression, in parentheses, shows how output (measured in dollars) per each 100 workers in a given industry can be calculated. This output measure is then multiplied by the capital share to give the expression for depreciation (or capital service inputs) associated with each 100 jobs in an industry. Another category of indirect jobs concerns those that are supported by the demand that relies on the wage and salary income of both direct jobs and supplier jobs. These jobs define the forward linkages from an industry’s output. For example, a job at a construction site also supports jobs in restaurants and diners where construction workers eat, grocery stores where they shop for food, and doctors’ offices where they pay for medical services. Public-sector jobs, supported by workers’ taxes, also fall into this category. The scale of induced jobs supported by each $1 million in final demand or 100 direct jobs in a given industry depends on the overall “respending multiplier,” or how much of a worker’s earnings are spent on consumption goods. Bivens (2003) reviews evidence on this multiplier and takes 0.5 as a conservative estimate of this effect.1 Induced jobs also depend on the relative wages of both direct and supplier industries. As an example, if automobile assembly jobs have wages that are 50 percent higher than the economywide average wage, this would lead to spending induced by each 100 jobs in that industry that is 50 percent higher than the economywide average, making the induced spending multiplier this much higher. Further, if the supplier jobs supported by automobile assembly (steel, iron, glass, etc.) pay higher-than-average wages, then this will also increase the induced spending multiplier for the automobile assembly industry. In this paper, I index hourly wages by industry to establish an economywide average (weighted by hours worked, obtained from the BLS ERM data) equal to 1.0. From here, one can express the induced jobs supported by each $1 million in final demand or 100 direct jobs in an industry as simply 100 times the index of average hourly wages in the industry times 0.5 (our respending multiplier). For supplier jobs, I multiply the (179 industries) vector of supplier jobs associated with a given $1 million in final demand or 100 direct jobs in the industry by each industry’s average hourly wage index, multiply by 0.5 (the respending multiplier), and then sum to estimate the induced spending from supplier jobs associated with final demand or direct employment in a given industry. Finally, we can estimate another forward linkage—the number of public-sector jobs (federal, state, and local) associated with each $1 million in final demand or 100 direct jobs in an industry. This measure differs across industries based on the relative wage of the industry. To generate the inputs for this calculation, I multiply each industry’s hourly wage by 2,000 to express it as a full-time, full-year salary. For federal taxes, I multiply this figure by 0.2, and for state and local taxes, by 0.1. These provide rough measures of the federal tax revenue and the state and local tax revenue supported by each job in an industry. I then use BEA data on tax receipts from federal, state, and local governments and BLS CES data on employment counts in these governments to measure how much tax revenue is required to support a public-sector employee in federal employment and how much tax revenue is required to support a public-sector employee in state and local government employment. For each of these two categories of public-sector employment (federal; state and local), I divide the tax revenue generated by each $1 million in final demand or 100 direct jobs in a given industry by this per-employee wage bill, and then sum the two totals, to get a measure of total public-sector employment generated. Note: See methods appendix for derivation. Note: Methods described in appendix. 1. This might seem too conservative at first glance, as most workers aren’t able to save half of their earnings. But this respending multiplier also includes the effect of taxes on earnings (which reduces the share of gross earnings available to be spent by workers on consumption goods) as well as the effect of imports—spending by workers that does not support demand in other domestic sectors of the economy. Even accounting for these effects, 0.5 might be too small. However, changing this parameter does not change the ranking of industries’ importance in generating induced jobs, just the raw numbers. 2. The spreadsheet is downloadable at go.epi.org/jobmultiplierdata. Bivens, Josh. 2003. “Updated Employment Multipliers for the U.S. Economy.” Economic Policy Institute Working Paper no. 268. Baker, Dean, and Thea Lee. 1993. “Employment Multipliers for the U.S. Economy.” Economic Policy Institute Working Paper no. 107. Bureau of Economic Analysis (BEA). National Income and Product Accounts (NIPA), Tables 3.2 and 3.3. Accessed November 2018. Bureau of Economic Analysis (BEA). GDP-by-Industry, KLEMS data. Accessed November 2018.